Having tested Fatstick’s 8.6ft version of the Fish some time ago we were looking forward to checking out its bigger sibling. With an elongated profile, to accommodate the extra length, the FS Fish plays on design traits found in classic surfboard shapes of the same name. 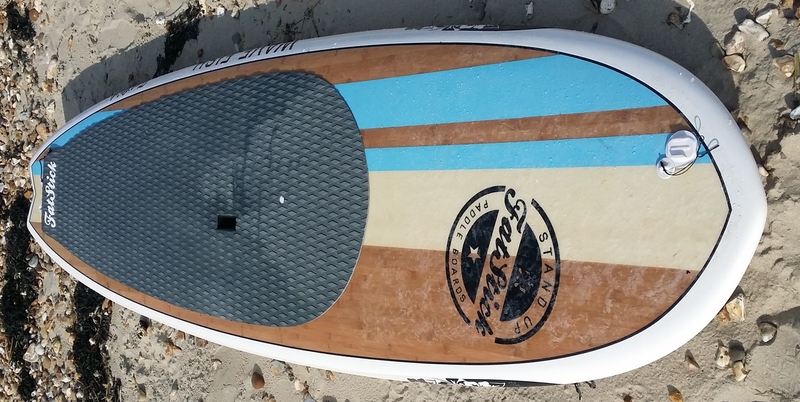 A pronounced swallow tail, five fin boxes and flat entry rocker suggest this is a SUP for less than perfect conditions but one that can be tuned for performance. With knuckles snuggly into the carry handle’s recess it’s a voluminous board that newbie paddle surfers will get to grips with quickly – the 33” worth of width only accentuating this. Yet, as we’re always banging on about, numbers/dimensions don’t give the full picture. Experienced paddlers may scoff at what they consider to be a sizeable SUP yet all isn’t as it seems. Sweeping away from the beach and the Fish’s manners are impeccable. Even with an elevated ride its stability is great – something which should inspire confidence heading out to the peak. Heavier paddlers will appreciate its glide and tracking while lighter riders could use it as an all round paddling machine as well as wave vehicle. Once on the peak positioning, and holding it, are easily achieved. It’s then simply a case of picking your wave. Putting the hammer fully down yields best results and once up to speed the Fish keeps its momentum. Dropping in riders can either stay further forwards, and enjoy a few mellow carves, or get over the tail to discover what this board’s really about. Above the fins paddlers may get a surprise at just how manoeuvrable this SUP really is. As mentioned dimensions tell you nothing about performance with the 9.6ft easily slamming into lips and re-directing with the best of ‘em. That momentum generated on take off keeps you flying and it’s then simply a case of picking a move you fancy or the wave dictates. While certainly not a new school aerial machine Fatstick’s Fish 9.6ft will deliver the kind of performance most paddle surfers are looking for. With impeccable manners, and real usability – across a whole plethora of wave environments – Fatstick’s Fish 9.6ft is a versatile SUP that delivers enough performance to keep even hardened wave warriors happy. Nippy and able to squirt the tail, bang some foam or simply cruise about the break it’s a SUP that’ll put smiles on all faces. Tune as either a quad or thruster fin depending on preferences.